What makes this different to normal, expensive SEO? Two reasons: we are specialists who work exclusively with dentists to provide custom online solutions way beyond “just SEO”, in fact SEO is just one small part of what we do and if that’s all you want there are plenty of other generalist companies around who we’re happy to recommend… plus we offer guarantees over and above what anyone else in the industry ever dares give (see Q.3 for details). It’s just like when you see a patient for the first time, you don’t start drilling right away, do you? You ask questions. Learn the history and what they want… then you prescribe solutions. Same with us. During your FREE 15-minute Dental Marketing Triage and Discovery Call I’ll ask you laser targeted questions which give me a good feel for your needs and exactly what’s required to transform you into the local area dominator. I work this way because at the start, I’m not sure if I can help you. And you probably have some questions of me as well. So the call gives us both a risk-free way to see if we are a fit moving forward. Not everyone who books a call becomes a client. We reject dental practices all the time. We GUARANTEE you’ll get AREA EXCLUSIVITY because we will work with no other dentist in your area/main suburb for as long as we work with you – yes, this limits our market reach but it ensures you get value out of the service you invest in! We GUARANTEE your work will always be COMPLETED ON SCHEDULE, according to the timelines given. We GUARANTEE Rapid Response to Inquiries, within 24 hours. We GUARANTEE a smooth, HASSLE-FREE PROCESS from start to finish. We GUARANTEE to ANSWER ALL YOUR QUESTIONS openly and honestly, in plain English free from “geek speak”. We GUARANTEE to work with you in relation to the current Australian local online marketing Regulations and Laws. We GUARANTEE complete flexibility with NO LOCK IN CONTRACTS. We GUARANTEE by the 7 month of working with us you will receive between 1 and 15 NEW online patient bookings per week. In the unlikely event we haven’t lived up to this result, I’ll pay out of my own pocket $200 worth of Facebook advertising for FREE until you do. And… I’ll even waive the Facebook $500 management fee (that’s a total value of $700.00 per month until you receive 1-15 new online patient bookings!). Because the internet is changing so rapidly it is very hard to put a timeline on this. One piece of advice is if anyone promises you top rankings inside a certain period, run a mile. Given all the variable at play (including changes to Google algorithms) this is impossible to do. 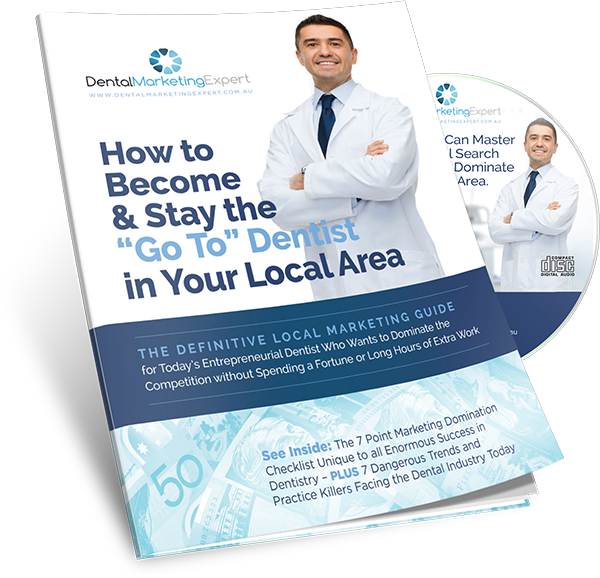 That said most of our clients have achieved top 3 of Google maps for “dentist+my suburb” within 12 months of working with us, and a good number have achieved that result in 6 months. Do you help with Social Media and Facebook? Yes. Not only do we help, we insist you create a strong social media presence. If you don’t, you miss a huge slice of the market, particularly the younger demographic. Can you build a new dental website? Like the answer for Q5… not only can we, we insist on you having a high converting dental website that is mobile designed! It’s the FIRST thing we do for you AND it comes FREE with your package… AND… it’s built for you within the first 30 days of you starting!! Do you do Mobile friendly design dental websites? Again, yes… we insist your website is mobile designed FIRST. You get this in the first 30 days which is vital because statistics show 53% of all bookings are made from a mobile device. If you’re not mobile friendly, someone else is stealing your patients. Facebook ads, do they work for dentists? Yes! It’s where a big chunk of your market hangs out so Facebook ads are a vital part of new patient acquisition. They work when you know what we know… and you must use them. How many new patients per week can we get from your online strategy and when? Easy answer… as per our guarantee… you’ll get between 1 and 15 new patients online PER WEEK by the end of 6 months with us or we’ll pay for $200.00 worth of Facebook ads (plus we include for free the $500 ads management fee) until you do.